Here is a funny one to get you going. There was dozens of 999 calls yesterday evening after an object was spotted crashing into the sea off Bray. As you can expect, there was considerable panic at the time and emergency services and the R.N.L.I were duly dispatched to the scene. At the time they didn’t know what they were dealing with but there were fears that someone had fell into the sea. The Irish coastguard received reports that an object had entered the sea 1 km from Bray. A crew of seven from Dun Laoighaire arrived fearing the worst. However, there fears were quickly allayed after they pulled a giant Mickey Mouse balloon from the sea. The balloon was carried into the sea by light breezes. Mickey said he had been mousing around when a breeze caught hold of him and he was grateful for the swift actions of the crew. 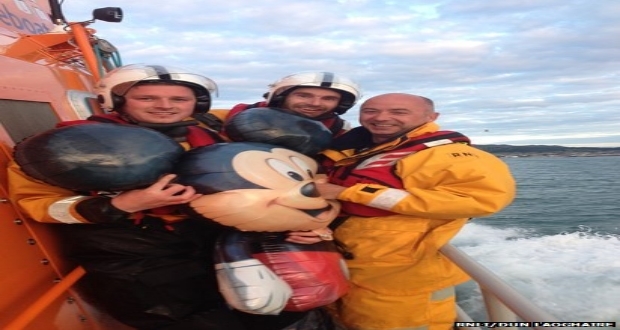 Thankfully there was a happy ending to this 999 call and Mickey was rescued safely.